Arsenal defender Shkodran Mustafi scored a superb headed goal to give the Gunners a 1-0 lead away to Cardiff City. After two defeats in their first two games, things seem to be coming together for new manager Unai Emery now. 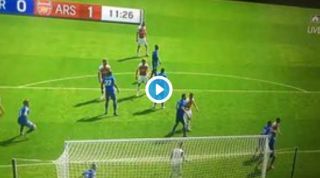 This superb corner from Granit Xhaka was attacked perfectly by Mustafi, who ran at it at great pace before finding the perfect placement to nod it into the back of the Cardiff net.